By far, this is my most effortless and comfortable look ever. 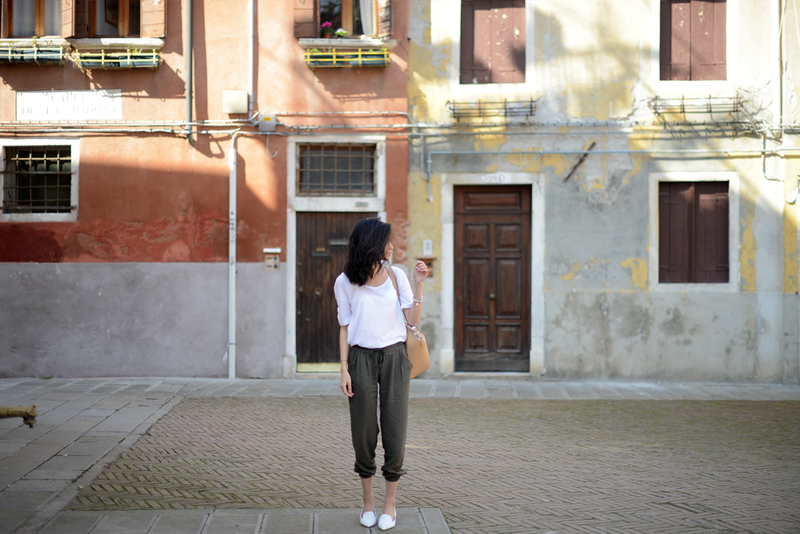 And the fact that I have Venice as my backdrop makes this post one of my favorite yet. I can't stress enough how much I love to dress simple. To me, keeping it simple is keeping it easy. And it couldn't get any easier than these pants from Aritzia paired with my go to tee and these white loafers that was pretty much made for me. Contrary to what you might think coming from someone who blogs about fashion, but I actually do not have a lot of clothes. I invest mainly on bags and shoes for the most part and as you can see from this outfit, my investments are my Antigona and these Nicholas Kirkwoods. These shoes are so me because they're pointed toe, white, and has an incredible heel detail. If that's not already enough, they're also incredibly comfy because the lining feels like suede.